Experience it all - watching exciting games, visiting students and working at nearby corporations - when staying at this charming Orlando hotel. Sports enthusiasts will be near Amway Arena, the Citrus Bowl and the Boardwalk Bowl. Unwind on the greens - Rio Pinar Golf Course is just six miles from this East Orlando hotel. Or, if you're looking for thrill and adventure, Orlando Speedway, Firkin & Kegler Family Entertainment Center, Congo River Miniature Golf and Waterford Lakes Town Center are all less than 12 miles from the Best Western Orlando East Inn & Suites. Many guests also enjoy spending time taking in the area's cultural attractions, such as the Bob Carr Performing Arts Centre and Harry P. Leu Gardens. With fine dining and shopping also nearby, there's always something to do when staying at this Orlando hotel. Make the most of your business trip while staying at this East Orlando hotel - Asbury Theological Seminary, Full Sail University, Siemens, VA Hospital and Lockheed Martin are all within a few minute commute. Whether you're visiting students or faculty, this Orlando hotel offers a location near Valencia Community College and University of Central Florida. Feel right at home in the spacious, clean rooms at this pet-friendly Orlando hotel. All rooms offer cable or satellite television with HBO , complimentary Wi-Fi, coffee maker, refrigerator, desk and more. Book one of our 38 suites and delight in an extra special stay. Get a wonderful start to each day with a complimentary deluxe continental breakfast with a waffle station and gourmet coffee selections. Relax after a day of sightseeing or working in the sparkling outdoor pool - adding to the serenity is the tropical landscape that surrounds the courtyard area. We also offer a barbeque area, free parking, a 24-hour front desk and a business center. For a stay in Orlando with a great location and impeccable service, make a reservation at the Best Western Orlando East Inn & Suites. From: The north. Take State Route 417 to exit 34, take a left, the Best Western Orlando East Inn & Suites is on the left. From: The south. 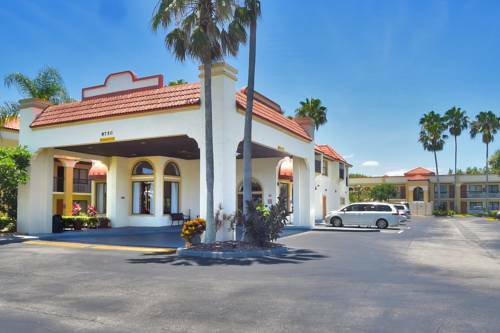 Take State Route 417 to exit 34, the Best Western Orlando East Inn & Suites is directly in front. From: The east. Highway 50, The Best Western Orlando East Inn & Suites is on the right. From: The west. Highway 50, The Best Western Orlando East Inn & Suites is on the left. 6.00 mile(s) from Red Lobster,, Seafood, 11:00 a.m. to 10:00 p.m.
5.00 mile(s) from Napolitaly, Pizza, delivery available, 11:00 a.m. to 11:00 p.m.
6.00 mile(s) from TGI Friday's, American, 11:00 a.m. to 10:00 p.m.
4.00 mile(s) from China Chef, Chinese, delivery available, 11:00 a.m. to 11:00 p.m.
4.00 mile(s) from Steak N Ale, American, 11:00 a.m. to 10:00 p.m.
6.00 mile(s) from Bennigan's, American, Irish, 11:00 a.m. to 10:00 p.m.
2.00 mile(s) from California Chicken, delivery available, 4:00 p.m. to 4:00 a.m.